When I trained to be a Resident Advisor at USC, they used to say the program was full of 2 kinds of people: the people that were inspired by terrific RAs and the people who were disgusted by terrible RAs. I fell into the latter group. After the fact, I got to be good friends with my freshman year RA, but during my freshman year, the guy was never around. I was reminded of this inspired-by-the-uninspiring today when I brought out The Periodic Table of Elements in my year 9 science class today. 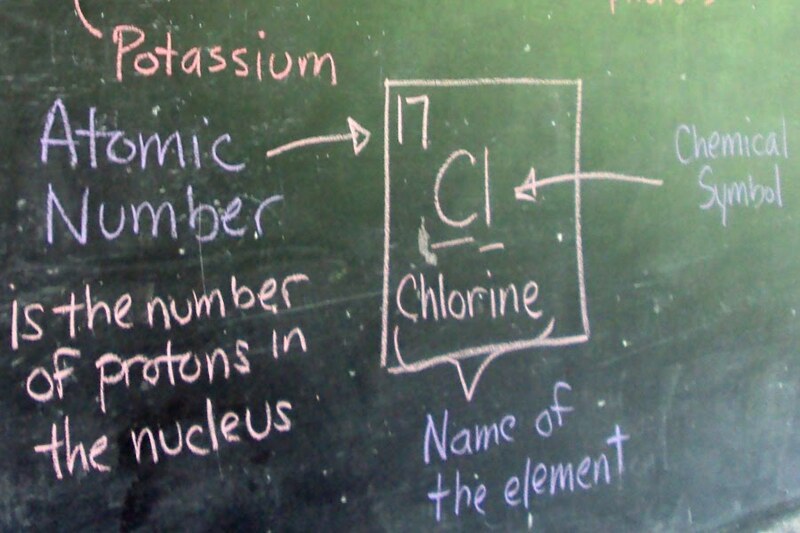 My high school chemistry teacher was lousy. At a very basic level, he was not a good teacher. His idea of providing a lesson was to hand out large packeted worksheets that we’d work on in small groups with little-to-no prior instruction. He probably would have described the method as Socratic and “problem-based”, but came across as apathetic and “lazy”. But worse than his methods was his attitude. He was, perhaps, the most discouraging teacher I’ve ever had. It wasn’t that he didn’t inspire any passion for chemistry, he made us feel like we weren’t worthy. Sometime later in high school I took one of California’s standardized tests for chemistry, and I did surprisingly well—the only reason it was surprising was because I was under the impression I was terrible at it. For some reason, I look back on this as a crucial point in my education, and I sometimes wonder how my educational path would be different if I’d had a more inspiring chemistry teacher. 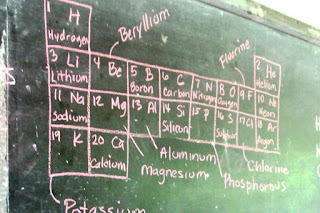 All this floated through my head as I drew an abbreviated Periodic Table on the chalkboard. The year 9 book only requires the students know the first 20 elements on the table, which meant I could cut out all the precious metals in the middle, thus making it easier to write out. 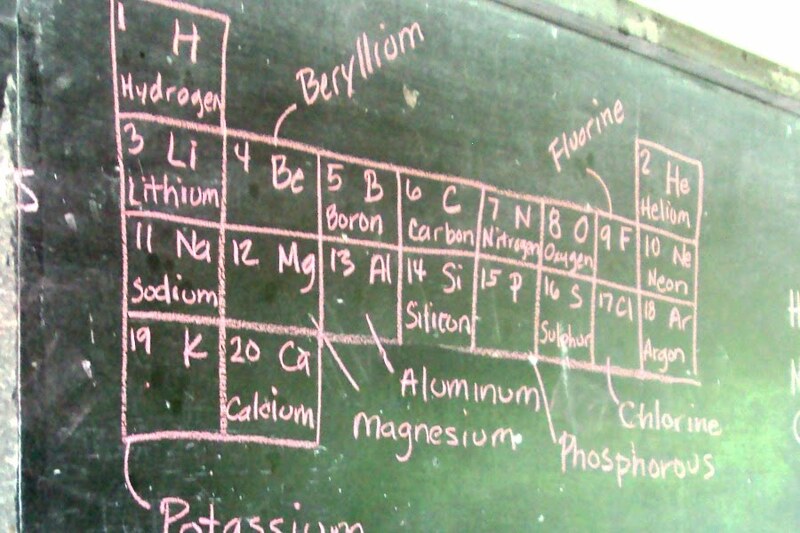 I’ve always had a lot of respect for the classic Periodic Table (Yes, there are new iterations, I know.). It’s a very simple visual representation of lots of different points of data. I like to think this respect came out in my lesson as I read off the first twenty elements. Also, the first twenty elements have a lot of fun aspects to them. 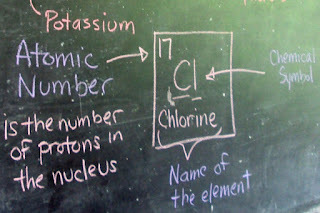 Helium in balloons, chlorine in swimming pools, calcium in milk. There are a few week hangers-on like beryllium and boron (although anyone who’s ever been to the Borax Museum in Boron, California would beg to differ), but really the first 20 carry themselves. Did I inspire a new generation of chemists today? Probably not. But I like to think that I didn’t discourage the possibility. The rest of my diagram.